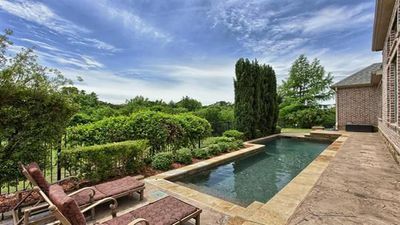 Scenic Private no smoking residence, quite neighborhood 20-30 minutes from Dallas - DFW Airport area, 45-60 minutes from Ft Worth. Pic won't load .... coming soon.... 3 Bedroom home but 2 are available for guests, 2 bath, full size hidabed-sleep 6 adults. Linens, Towels included. Kitchen has all appliances, dishes, pots/pans, coffee goods, some spices, paper towels and hand towels. Baths have hand soap, toilet paper. wifi included. Home pet friendly w/a Lg crate available to use. . Living area -TVs with local channels. Great sunsets from deck. Yard is kept Tues. 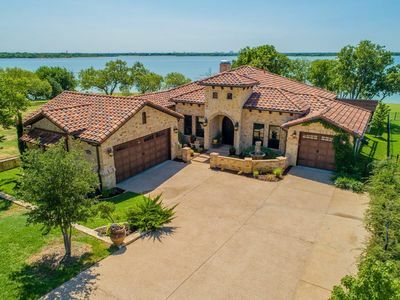 Experience the taste of Tuscany and all that lake Lewisville has to offer from our comfortable lake front luxury home. Choose a Tuscan wine of your choice (leave a bottle, take a bottle) from our private collection and relax in the heated spa, play in the pool or enjoy dinner in our outdoor kitchen. All bedrooms are well-appointed and have comfortable mattresses. Other amenities include Wi-Fi, Keurig Coffee Bar, Apple TV and a Blu-ray player. 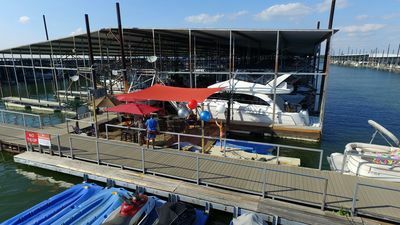 Less than 5 miles to popular places such as Little Elm Beachfront Recreational Park, Hidden Cove Park and Marina, Hydrous Wake Park, Beard Park, Hula Hut and Tower’s Tap House. We are only 24.3 miles from DFW airport and 32.3 miles from Dallas Love Field. 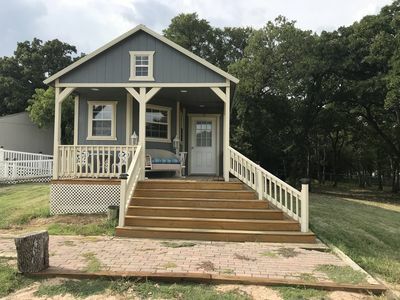 Your own tiny Lake house on Lake Lewisville. Your own shoreline. Watch the sunrise. Watch the sunset. Boating, fishing, kayaking. Use the fire pit. Roast s'mores. Your own grill. Bring the family. Bring the boat. Bring the dog. Bring the kids. Washer and Dryer, full kitchen with slide in range, microwave, and dishwasher. Solar lights lights in all the oaks turn on at night. The cottage is a magical place at night. Come join us. We will leave the light on. Built by a vacationer for vacationers. We absolutely love this property so we have put our blood, sweat and tears into making it the perfect getaway for any occasions! 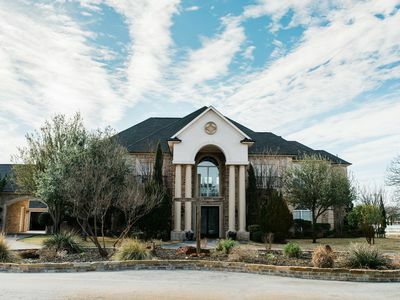 This beautiful cove lake house is situated right in the heart of Little Elm, TX. Come enjoy your own oasis of tranquility and solitude located on Lake Lewisville. Watch the sunrise and the sunset and enjoy your own beach! Day use for event option is available for wedding, event space. Contact us for request. 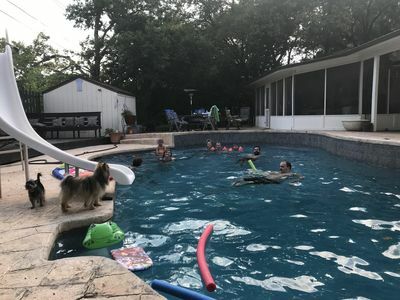 House is located on Lewisville Lake, lots of quite time, birds, trees and a beautiful lake with all that comes with a lake boating, jet skiing, fishing, canoeing and a great walk on the beach. This house was part of the house in front of this house and when there was an issue with the rooms that hooked the two together it was decided to split the houses up and have two houses. They were totally rebuilt and remodeled in 2015, new electric, new walls, new plumbing and new floors. The house is two stories and the first level a kitchenet and bathroom. The second floor bedroom, setting area large hall and large closet. Room for a foldout twin bed and also blow up bed. Very perfect for one or two. A great place to set in the back yard next two the water and watch the quite of the world go by. Escape from it all in our completely renovated Lewisville Lake front House, nestled on a quiet cove that is perfect for swimming. Pull your boat up on our sandy shoreline or relax in the shade of our mature trees. You and your guests will enjoy your time inside or outside with open water lake views. Enjoy Little Elm or Frisco with dining and entertainment just minutes away. Perfect for a family getaway or a "friends get together" with all of the amenities you would expect from a nice hotel. We purchased this home and we are finishing our renovations!! More photos will be posted soon! SPECIAL WINTER/EARLY SPRING PRICING It's all about the experience!! Come stay at a waterfront property instead of a hotel - no matter what brings you to the area. It is perfect for all ages who want to experience a comfortable house and its outdoor amenities in a great location. Get back to nature and have a campfire right out your door while surrounding yourself with nature. Kayaks, Canoe, Paddleboards are included at no extra cost. Bring your own boat if you would like. We have a dock that is located right behind that house that we share with our guests. It is also great for fishing and swimming. Bring your floats and cooler and come to relax. We welcome long term rentals over the Winter and Early Spring season. Our homes are fully furnished. We have 4 true waterfront homes that are perfect for small families or couples. Please call for Monthly rates. Great for short term rental - Monthly specials. 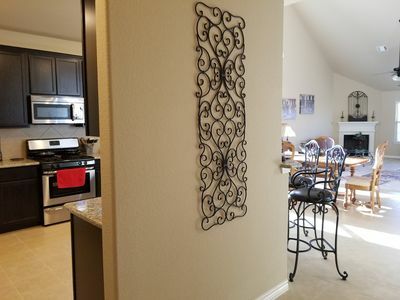 Pricing varies with number of people and length of stay Weekly rate $1100 3 day minimum $175 Monday - Thursday and $250 Friday - Sunday Our Lake Lewisville lakefront is great for swimming, boating, fishing or just sitting back and relaxing while enjoying your favorite beverage. The sunsets from the back porch or burn pit are amazing. We also have kayaks, canoe and paddle boards that are available for our guest to use at no additional cost. Are you in town for a football, baseball, soccer, basketball, ultimate frisbee, gymnastics or virtually any other sport? Our house is located just a few miles down the street from Toyota Stadium, Dr. Pepper Arena, Dr. Pepper Ballpark, The Cowboys - Ford Center at the Star, and The Fieldhouse. There many other athletic venues close by. 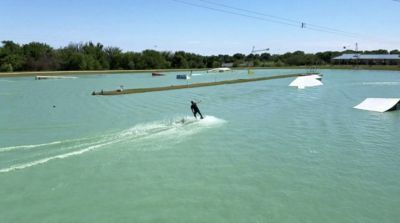 Hydrous cable wake boarding park and the fun Hula Hut Restaurant is across the cove from the house in Little Elm. 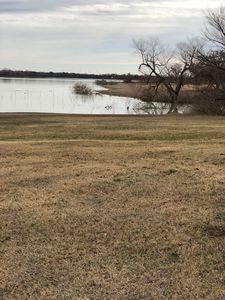 Little Elm sandy beach park is just minutes away as well. There are also several marinas close by with on-the-water dining at Hidden Cove Park. The location of this house cannot be beat. A perfect place to stay when visiting the DFW area for a vacation or wanting a staycation. Lewisville Lake is a Corps of Engineer Lake and shoreline. As adjacent property owners, we and our guests abide any restriction. Motorized vehicles forbidden off roadway. NO PARTIES ALLOWED WITHOUT PRIOR WRITTEN APPROVAL No dates are reserved without a signed rental agreement and security deposit. Keywords: Waterfront Accomodations, Frisco Accomodations, Little Elm Accomodations, Toyota Stadium, UNT, Hall Office Park, Frisco Rough Riders, Friso Convention Center, Frisco Superdrome, Hydrous wakeboard Park, Hula Hut, Executive lodging, Romantic Getaway, Extended stay, corporate housing, short term rental, Dr Pepper Arena, Dr Pepper Ballpark, The Fieldhouse USA, The Ford Center at the Star, Toyota Headquarters, FedEx Headquarters, University of North Texas, Texas Woman's University. Looking for a fully furnished temporary home? Corporate housing or in between homes? Check our winter rates. Contact us for our rates per month - all bills paid. 30 day minimum. Monthly specials vary with number of people and length of time. Weekly rate $1100 3 day minimum $175 Monday - Thursday and $250 Friday - Sunday The Lake is at a perfect level. It should be a nice summer for enjoying the lake. Our chic and cozy lake house has everything you need to have a great time. Peaceful area great for swimming, fishing, wildlife watching, kayaking, canoeing and/or paddleboating. Our Guest houses are together, so if you have a small group, you can rent another one or two. 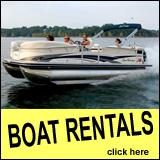 We have our deluxe Pontoon boat we rent exclusively to our guests, when available. We also keep kayaks, watermats, a canoe, and a paddleboat available for our guests to rent when conditions permit. This particular property's first bedroom has a Queen bed and the second one has a full bed with a twin trundle bed. We have a charcoal grill and a wood burning campfire pit that is always a hit with both adults and children. This house is a wonderful place to relax and watch a gorgeous sunset either at the burn pit or under the covered porch with a sunset bar. The porch has a table and two bar areas for you to use. The porch is equipped with a ceiling fan to help you stay cool while enjoying your favorite beverages or food. We provide satellite TV on a new large screen TV and wireless internet. The kitchen is fully furnished with new stainless steel appliances, including a convection oven. Our lakehouse is conveniently located 7 minutes from downtown Frisco. Toyota Stadium, Dr. Pepper Park, Mall, and fine restaurants are just minutes away. There are lots of restaurants, shopping areas, and family entertainment opportunities just minutes from the house. DFW and Love Field are on 35 minutes away. Our house is perfect for the couple or small group that would like to getaway for the weekend or week. No dates are reserved without a signed rental agreement and security deposit. Keywords: Waterfront, Frisco Accomodations, Little Elm Accomodations, Pizza Hut Park, UNT, Hall Office Park, Super Bowl, Frisco Rough Riders, Frisco Convention Center, Frisco Superdrome, Stonebriar Mall, Six Flags, Close to DFW, Love Field, Texas Rangers, Downtown Dallas, Great for Corporate Housing, Cozy, Chic, Romantic, Cottage, Family, extended stay, short term rentals, long term rentals. Escape to this lake community called Knob Hill and rediscover friends and family. Knob Hill is located on a peninsula jutting out into Lake Lewisville in Little Elm TX. The Hideaway @Knob Hill offers your family a peace filled retreat into a quiet lakefront community with every amenity you could possibly need. More information The space We provided large screen TV s in every room, with a 65" TV in the living room. Cable with over 200 channels including Fox Sports and ESPN 1, 2 &3 for sports enthusiasts in the family. We have high speed internet access with upload and downloads speeds of one gigabit. With wifi access throughout the house and garage. The 2 1/2 car garage has been converted to a game room with air hockey table, ping pong table, bumper pool table, and board games of all kinds. This home is not on the water, but will have access to the lake one block away. A kayak's are available for your use. Lakefront on Lake Lewisville! Ski, boat, fish!! This lovely home is located on over 18 acres that is Lakefront to Lake Lewisville. Enjoy sunrise over the lake from the deck with your morning coffee and sunset over the pasture. Our longhorn cattle provide a further picturesque environment for your enjoyment! We are truly an oasis in the middle of the DFW suburbs. 35 miles from Dallas, 2 miles from groceries, and restaurants, 12 miles from Denton, about the same from Dallas North Tollway and only 7 or 8 miles from Little Elm city center. You can ski, fish, boat and swim right in front of our property or go for a 10 minute ride by boat to the main lake. Anchor right here in front of the property to keep your boat conveniently located during your stay! In addition, the fishing seems to be superb right here off of our bank as you can see in the picture from one of our most recent renters! Private gated drive and plenty of parking space. If you like the peace and quiet, wildlife and country living while still being close to the suburbs, this is the place for you. New house with amazing view of the lake/sunsets! LAKE view corner lot on lake Lewisville , new build LUXURY house! Huge 3,500 sq feet, 4 bedrooms / 3 baths, garage. Big living room. Master bath has double sinks, roman (garden) jetted tub. Backyard have table for 6 people. With lovely view of the lake - its great for exercise, tanning, relaxing, and watching amazing sunsets. Internet TV, no cable TV. House located in quiet and safe neighborhood, with Bicycle and Walking/Jogging Trails. At near by parks/marinas we have access to Camping, Swimming, Fishing, Windsurfing, Waterskiing, Kayaking, Boat rentals. We don't have dock or pool on property, but here is distance for parks/marinas near by: Doe Branch Park, boat ramp - 4 miles. Dallas Corinthian Yacht Club/marina - 10 miles. Cottonwood Park/marina - 12 miles. Little Elm boat ramp/dock - 11 miles. With this house you don't even need VACATION home or COTTAGE bcs area surrounded by Golf courses, Parks and Marinas with Boat Ramps and Storage. Perfect if you have a BOAT, or thinking to get one! The Tribute COLF Club and Wynnewood Park/Marina 15 mi away. This house can be your own weekend getaway destination! We also have so Farms, Wineries in the area! 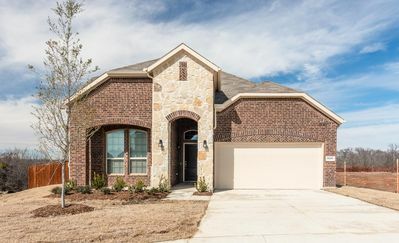 Welcome to this brand new home conveniently located with a view of Lake Lewisville from back yard and within a few minutes drive of many local attractions, the Cowboys Training Center, Toyota Stadium, Shops of Legacy and many other local attractions. Shopping at Stonebriar Mall is within 15 minutes drive from this property. The open concept floor plan has 3 Bedrooms and 3 full bathrooms, and a super big family room. The master has a king size bed, 2 bedrooms have queen sie beds and pull out bed in media room. The property is perfect for families or weekend getaways with friends. Enjoy the flat screen tv in living room, media/game room, master bedroom and 1 bedroom. Lakefront Cabin! Perfect for the close by quick get-away or temp living! Stay on the shoreline of Lake Lewisville close to town yet very private! One room tiny cabin with full bath. Beautiful views with sunrise over the lake out the front door and sunset over the pasture as well as direct access to the lake! You can sit on the front porch and enjoy the lake while watching the birds go by or take your chair and walk a couple hundred feet to the shoreline and go fishing if you want. Accommodates two guests with a comfy futon that converts to a double bed. Private gated drive and plenty of parking space. If you like the peace and quiet, wildlife and country living while still being close to the suburbs, this is the place for you. You can be on I-35 in minutes as well as the Dallas North Tollway. We have longhorns for your viewing pleasure and plenty of wildlife that may wander by including wild turkeys, deer, egrets and more. For the quick get-away, bring your boat right out front to the shoreline and ski, fish or just play right here in the cove or take a 10 minute ride to the main lake. We have outdoor tables and chairs with grilling available. “The Deck House” is one of the most famous and unique houses on Lewisville Lake! Whether you are looking for a classy corporate retreat or a comfy family getaway this house can fit any occasion. Three stories of decks and direct water views and unlimited entertaining potential. Watch the sunrises and sunsets from the hot tub on the second floor or while laying in a lounge chair or hammock next to the lake. If you want an unforgettable Lake Vacation Year Round then “The Deck House” is for you! Located in Lake Dallas, Texas, Moments Retreat Center is the ultimate in weekend getaway retreats. With a serene "relaxed elegant" vibe, you can work on your projects, have meetings while pampering yourself with relaxing on-sight spa services, optional catering or a visit to the lake just 7 minutes away. Come stay with us and experience for yourself, all that Moments Retreat has to offer. Tours are available by reservation only. Moments Retreat is the most luxurious crafting/prayer/events retreat in North Texas but we are also ideal for family gatherings, corporate events and church groups. To accommodate different groups we have added double size beds to several rooms. That means more sleeping spaces!! This beautiful property is located within a few minutes drive of Lake Lewisville, the Cowboys Training Center and other local attractions. Shopping at Stonebriar Mall is within a 10 minutes drive and only 10 minutes drive to the high end Shops at Legacy. 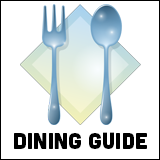 Toyota Stadium and downtown Frisco are a short drive away for restaurants and sightseeing. The open concept makes it easy to entertain and more enjoyable. The home is perfect for families or weekend getaways with friends or can be used as corporate housing. The property has 4 bedrooms, 3.5 bathrooms with game room and media with plenty of space for entertaining and fun. Enjoy the comforts of home with the 4 flat screen tv's. 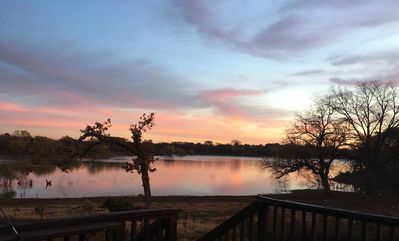 Located in Lake Dallas, Texas, on 3 private acres, Moments Retreat Center is the ultimate in weekend getaway craft retreats. With a serene "relaxed elegant" vibe, you can work on your craft projects while pampering yourself with relaxing on-sight spa services, optional catering or a visit to the lake just 7 minutes away. Come stay with us and experience for yourself, all that Moments Retreat has to offer. Moments Retreat is the most luxurious crafting retreat in North Texas but we are also ideal for family gatherings, corporate events or church groups. To accommodate different groups we have added double size beds to several rooms. That means more sleeping spaces!! 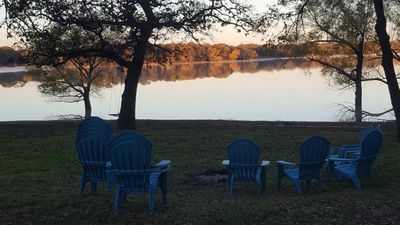 Located in Lake Dallas, Texas, Moments Retreat Center is the ultimate in weekend getaway craft retreats. With a serene "relaxed elegant" vibe, you can work on your craft projects while pampering yourself with relaxing on-sight spa services, optional catering or a visit to the lake just 7 minutes away. Come stay with us and experience for yourself, all that Moments Retreat has to offer. Tours are available by reservation only Moments Retreat is the most luxurious crafting/Prayer/events retreat in North Texas but we are also ideal for family gatherings, corporate events or church groups. To accommodate different groups we have added double size beds to several rooms. That means more sleeping spaces!! Lakefront Cabin, lake Lewisville, Ski, Boat, Fish, Swim! 18+acres! Enjoy a very private cove on the north part of Lake Lewisville with over 900 feet of shoreline! The cabin is only 200 to 300 feet from the actual shoreline. 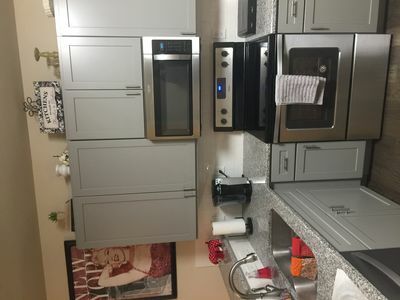 Cabin includes a refrigerator, cooktop, microwave, toaster over and mini-dishwasher along with all the cooking utensils and plate ware/flatware/glass ware one would need to enjoy a get away at the lake! Also provided is a propane grill for steak night!! 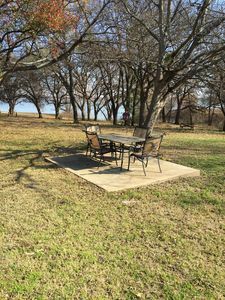 You can sit on the front porch and enjoy the view for sunrise/sunset or sit under our private grove overlooking the lake in the breeze with your glass of wine! 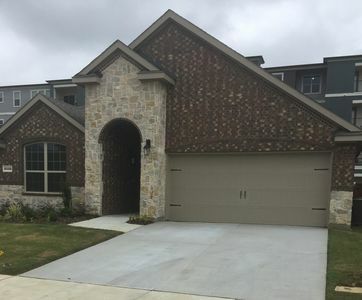 Although very quiet and secluded, you will only be a short few minutes from all the modern conveniences and just a short drive to major thoroughfares if you need to get to just about anywhere in the metroplex. Whether its just taking in the view, fishing off the shoreline, having your boat anchored here, or just enjoying the day swimming in the lake with family and friends, you won't want to leave!! Lakefront, Lake Lewisville, Ski, Boat, Fish, Swim! 18+acres,900+ feet shoreline! 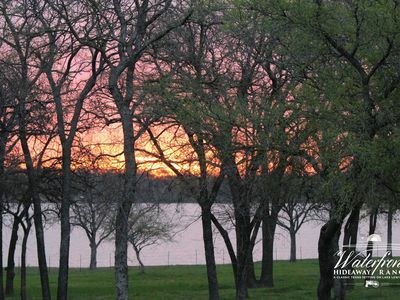 We are on over 18 acres of beautiful lakefront property on Lake Lewisville! You can walk down to the lake or drive your vehicle to within 50 feet of the shoreline. Enjoy sunrise over the lake from the deck with your morning coffee and sunset over the pasture. Our longhorn cattle provide a further picturesque environment for your enjoyment! We are truly an oasis in the middle of the DFW suburbs. 35 miles from Dallas, 2 miles from groceries, and restaurants, 12 miles from Denton, about the same from Dallas North Tollway and only 7 or 8 miles from Little Elm city center. You can ski, fish, boat and swim right in front of our property or go for a 10 minute ride by boat to the main lake. Anchor right here in front of the property to keep your boat conveniently located during your stay! In addition, the fishing is superb right here off of our bank as you can see in the picture from one of our most recent renters! Private gated drive and plenty of parking space. If you like the peace and quiet, wildlife and country living while still being close to the suburbs, this is the place for you. 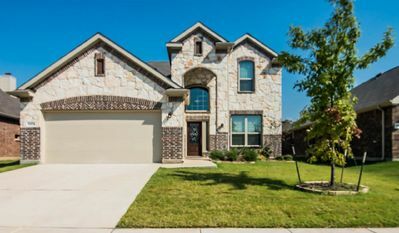 Get away and feel right at home in this beautiful home that is within a few minutes drive of many local attractions, the Cowboys Training Center, Toyota Stadium, Shops of Legacy and many other local attractions. This gorgeous home is within 5 minutes of Lake Lewisville. 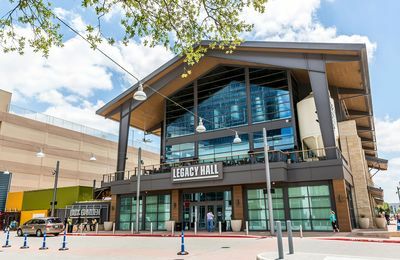 You can enjoy shopping at Stonebriar Mall which is a 15 minute drive and only 15 minutes to the high end Shops of Legacy. Downtown Frisco is a short drive away and offers great sightseeing and restaurants. The home is perfect for families, weekend getaways with friends or business travelers and great for corporate housing with all amenities of a cozy home.. The house is perfect for long term housing. If you are interested in long term rental please reach out to me even if it shows unavailable for additional listings. The property has 4 bedrooms, 2.5 bathrooms with plenty of space. There is 1 king bed and 3 queen beds and each bedroom has a dresser with a mirror and an end table. 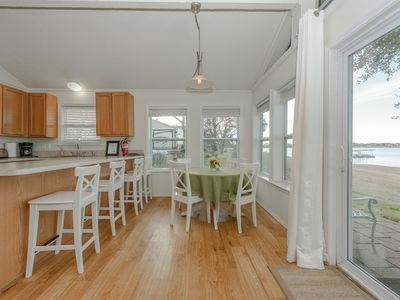 The kitchen has lots of space for eating at the table or on the bar stools. 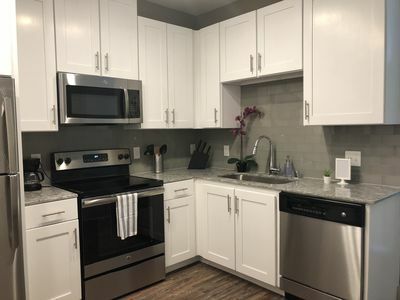 There are many extra amenities including plates, silverware, blender, toaster, coffee maker and other amenities that will make you feel at home. There are 2 smart TV's in the house 1 in living room and another in the master bedroom plus 2 TV's in 2 of the other bedrooms. Our Denton County country guest house which is located in the heart of the DFW Metroplex…approximately 40 miles northwest of downtown Dallas, 40 miles northeast of downtown Fort Worth and 60 miles from Arlington. 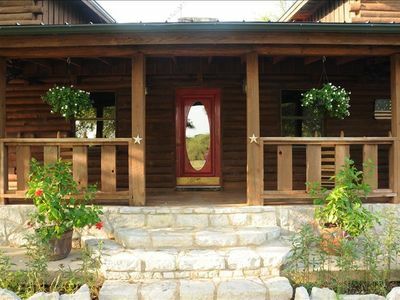 The restored Texas log farmhouse is nestled amongst gorgeous 100+ year old live Oaks trees. Think of a rustic but cozy and elegant Colorado lodge. There are spectacular views with some pitch and roll offering the true beauty of this impressive countryside. Have fun watching the horses graze, deer feeding at dawn and all the wonderful bird species that come our way. 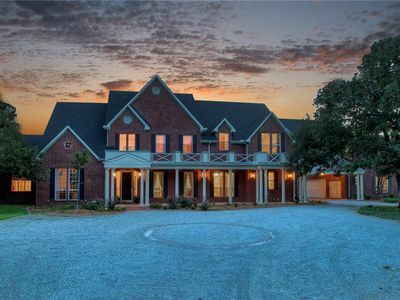 Located on 22 acres down a secluded country road. 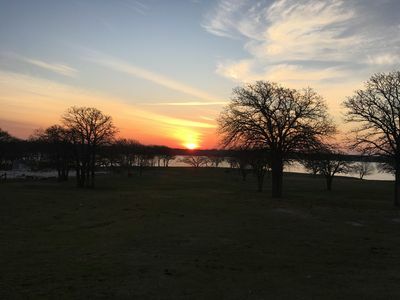 Enjoy the beauty of a clear Texas night before bed and a fresh cup of coffee or tea on one of the two large porches, complete with rockers, while you watch our magnificent Texas sunrises and sunsets to relax your body and soul. Watch the horses graze, the chickens hunt for bugs...we sometimes have deer and wild turkey come up to the house. Also take time to sit by the pool while sipping on your favorite beverage, or enjoy the wood burning fireplace inside! Outside you will have access to a private pool. There is a fire pit by the pool and we have an outdoor propane grill available. We provide the firewood and the propane for the grill. This is a working horse breeding facility. You will see the trainers and barn workers busy with the horses. We ask guests to not visit the barn or pet the horses unless an employee of Los Arboles is available to be with the guest. But, if you and your guests would like a tour of the barn...just notify us. If we are available we would love to show off our barn and horses. We typically have one to three baby horses (foals) born per year and they are adorable. In the spring and summer we incubate and hatch chicken eggs. Come see!! The house has six bedrooms, 4 baths. 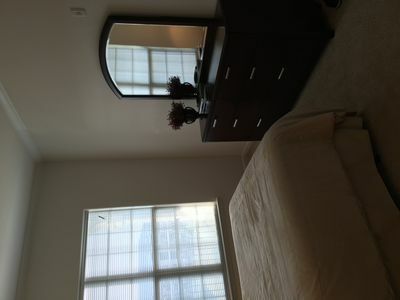 Downstairs is the master bedroom with queen bed, master bath with double sinks off the bedroom. The other bedroom downstairs has twin beds with a bathroom off the side. There is a family room with a flat screen TV, DVD player, wood burning fire place, fully stocked kitchen and small dry bar. The glassed in back porch shares the wood burning fire place with the family room and has a sitting area and dining table. Upstairs are four bedrooms (two with queen bed and two with double beds) and two baths. Please note that the log cabin design provides for an open concept and the upstairs bedrooms do not have doors. There are privacy screens available to shut off the bedrooms from the hallway. Also upstairs is a game room with the ping pong table. This property is in an amazing location. Close to Denton, McKinney and Frisco. 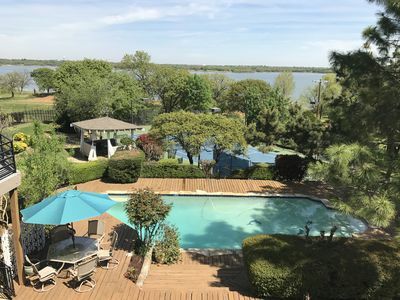 While you will be in a secluded country area...around the corner are restaurants, a huge Walmart for shopping and Lake Lewisville is six miles away. The property is very convenient to all the wedding venues in Aubrey as well. While sitting on the porch and watching the livestock is my favorite thing to do...here are some other cool things to do while staying at the property. 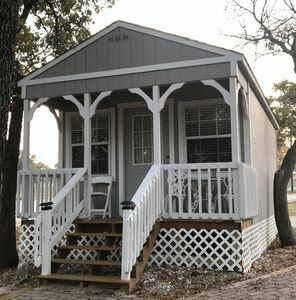 http://www.hydrouswakeparks.com/home https://www.littleelm.org/201/Little-Elm-Park http://www.escapingthesquare.com/ https://www.dentonwaterworks.com/https://www.hopperranch.com/ Keywords: Log Home, Country Estate, Frisco Accomodations, Little Elm Accomodations, Toyota Stadium, UNT, Hall Office Park, Frisco Rough Riders, Friso Convention Center, Frisco Superdrome, Hydrous wakeboard Park, Hula Hut, Executive lodging, Romantic Getaway, Extended stay, corporate housing, short term rental, Dr Pepper Arena, Dr Pepper Ballpark, The Fieldhouse USA, The Ford Center at the Star, Toyota Headquarters, FedEx Headquarters, University of North Texas, Texas Woman's University. 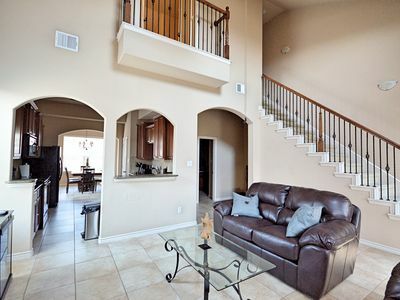 Luxury 3 story townhome within walking distance to Lake Lewisville's Marina 121. 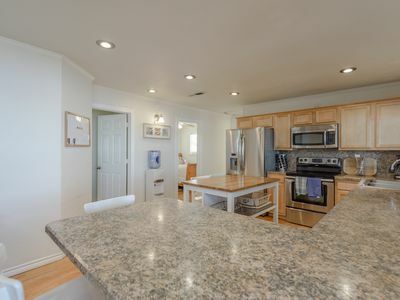 Beautifully upgraded w cathedral ceilings, granite, cherry cabinets, c-tile, etc. Master suite on 3rd floor w-dbl sinks, sep tub & shower! Relax in front of your fireplace when its cold out and on your balcony when it is warm. Secondary bedrooms is has a queen bed and on the 1st floor and the third bedroom has a full size bunk bed. Two of the bedrooms also have desks and makes a great stay for business. Keyless entry, code is changes between each tenant for security. All TVs are Smart TVs with build in WiFi We currently have Sunday ticket (all NFL games) Whole house DVR, record 5 shows at a time. House Inventory: Master Bedroom Queen Bed Dressor Night Stand Walk in Closet 32" TV with Direct TV Desk Office Chair Master Bathroom Garden Tub Standing Shower (separate from tub) Toilet (enclosed) Double Vanity Ceiling Fab Living Room Two Seater Couch (leather) Two Seater Couch (second) Coffe Table TV Stand 48" Smart TV (wifi) with Direct TV Kitchen Double Sided Refrigrator Electric Stove Pantry Garbage Disposal Microwave Keurig Coffe Maker George Foreman Grill Toaster 4 white bowls 6 plates 6 bowls 6 saucers 6 other small plates 8 big spoons 8 big forks 8 small spoons 8 small forks 8 butter knives 8 stake knives 1 large soft spoon 1 large spachela 1 fryer 1 baking pan 1 serving tray First Aid Kit Hand soap in every bathroom Trash bags Replacement light bulbs Salt/Peper Broom/dust pan Mop/bucket Dinning Room Solid wood 6 seater table 6 Chairs Second Bedroom Queen Bed Dressor 26" TV with Direct TV Closet Nightstand Second Bathroom (1st Floor) Tub/Shower Toilet Third Bedroom Full Size bunk Desk Thermostat on each floor Take Virtual Tour: https://youtu.be/u6fkn3LunYc HD cable, internet/wifi and all utilities included. Modern Apartment that has everything to offer! This home offers a full kitchen with pots/pans/utensils, highspeed internet, and all the essentials. 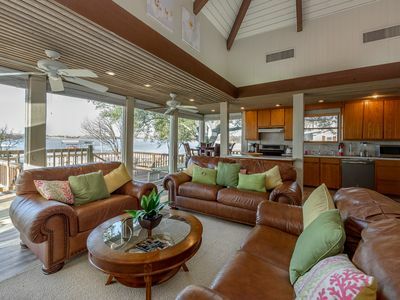 Blocks from Lake Lewisville and Pier 121 Marina, this home offers a unique living experience close to the water’s edge. 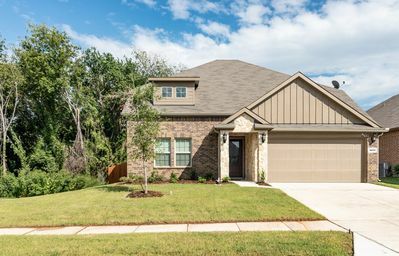 Located in a convenient well kept neighborhood only 10 minutes from Legacy West/The Star, plenty of shopping, and a mere 15 minutes from DFW airport. This home has everything needed for your stay! Enjoy cruise and overnight stay on this beautiful yacht. Spacious accommodation inside and out w/ 2 bathrooms and 2 bedrooms with queen beds. Boat is equipped with 4 AC/heating units to keep you nice and comfortable through out the year. This Meridian 411 yacht is one the best designed yachts that is spacious and allow full lake visibility even when inside. If you have questions or special request please contact us. Note: Overnight stay is only available with charter (taking boat out w/ captain) at an additional price of 250.00 per hour with 3 hour minimum if staying one night and 6 hours for two nights. The six hours can be split 3 hours one day and 3 hours the following day. Charter capacity is 14 and overnight stay is 4. Charter only is also available @ 300.00/ hr Fri - Sunday and 250.00 / Monday - Thursday. A true executive home, this two story 4 bedroom / 3.5 bathroom brick colonial property in the Highland Shores community of Northern Dallas area. From the moment you drive up the expansive driveway and view the grand two-story entrance you know this executive luxury rental is the perfect home away from home. 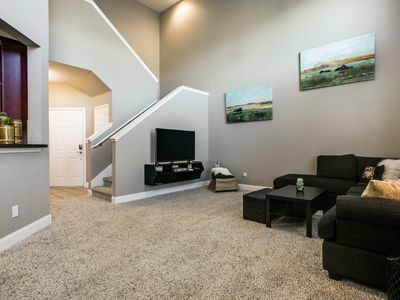 Contemporary interior design and open floor plan makes this property a great lodging solution for multiple executives or a relocating or displaced family. Truly this property exemplifies the perfect balance between comfort and luxury. Built in 1990 on a quarter of an acre, the property also offers central air conditioning, 2 car garage parking, washer and dryer, cable, High speed internet 75/75, community jogging trail and exercise court. The interior of this home is bright and light and has been meticulously furnished and updated with high attention to details and new paint. The main floor of the property is open and gracious with two-story entry, formal living room, family room, eat-in kitchen and formal dinging room. This space features a two-sided fireplace, bay window, French doors, wood crown molding, wood accents, custom paint, custom cabinets and large modern kitchen with built-in island for additional space. The kitchen connects to the outdoor deck, large expansive tiered backyard landscaping. The second floor, features 4 large formal bedrooms with vaulted ceilings enhanced with ceiling fans for maximum comfort. The master bedroom has a two-way fireplace that compliments the 5 piece master bath with jetted tub, glassed shower and large mirrored master closet. Each bedroom has a complete design theme with matching window coverings and bedding. Highland Village is in Denton County, Texas and is serviced by McAuliffe Elementary School (Pre Kindergarden – 5th grade), Briarhill Middle School (6-8 grades), and Marcus High School (9 – 12th grades). This community offers convenient access to jogging, walking paths and neighborhood amenities. Again, this property have enough space for multiple corporate travelers. Has High Speed 75/75 WIFI with an office space. 2 car garage for free parking. 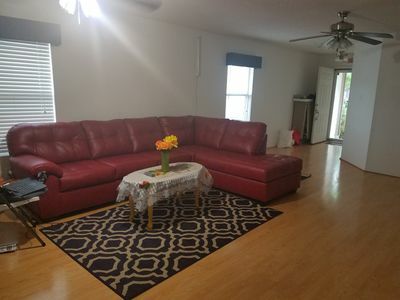 Property is owned and managed by a local Denton resident who would like to welcome you to Denton and connect you with all the needed resources during your stay. This property is conveniently located in the city of Aubrey Texas, not far away to Dallas only 45 minutes drive, Frisco 20 minutes drive, Denton 10 minutes drive. Only one bloc away to Walmart and many restaurants and gas station. The house has 4 bedrooms all furnished: TV, bedding, walk ins closet and 2 bathrooms. 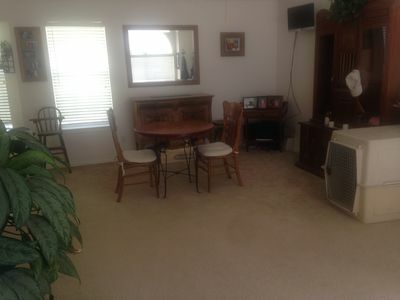 Very spacious Living room and kitchen also furnished: TV, couch, refrigerator, 6 dining chairs. Porch at the back yard. Our beautiful, large house has a front courtyard, a dive pool, a covered, screened in porch, newer beds, well equipped kitchen with nicer appliances, sunken living room and much more. It is located close to shopping, restaurants and entertainment. An on-site caretaker will be in the master bedroom which has a separate entrance and is locked from the hall side. He will never enter the house or backyard area unless there is an issue and only with the guests permission. All bedrooms have flat screen TVs with streaming including Netflix, Hula and Amazon. All bedrooms have dressers and large closets for storage.The large hall bathroom has a separate tub and toilet room. The half bath off the laundry room is great for coming in from the pool. 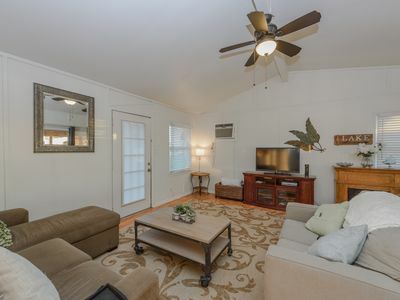 There is a beautiful, private courtyard in the front and a covered, screened in porch in the back. 2 private bedrooms in a new subdivision in southern Denton. Close to Denton Square, DCTA train, UNT and TWU. Close access to I-35 (2 Min) 5 Minutes to Lake Dallas 20 Min to DFW airport and Close to Dallas or Fort Worth. For gamblers only 35 minutes away to winstar casino! The house is occupied by my mother who understand Very little English but she speaks Spanish. Please practice your spanish with her. Very nice quiet great Location! 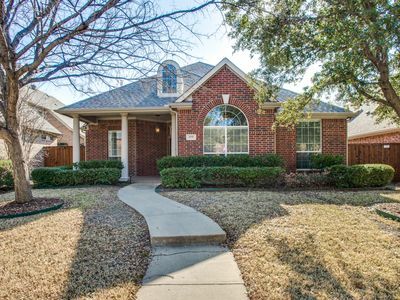 Closed to DFW airport, Lewisville lake, golf course , all major highways . Share bathroom! Sorry, there is no cable Tv or internet But I will provide towels, Warm bed, warm shower, nice kitchen, laundry room, cover back porch, Treadmill, etc It is a beautiful house is located in a nice quiet neighborhood , but still close to everything, about 10 Miles away from DFW airport, just a few minutes away from Lewisville lake, right by a golf course, close to train station. Love this location, great location for travelers. This Ful size one bedroom one bath upscale apartment home with balcony overlooking the park and resort style pool is fully furnished. Includes a fully equipped kitchen and full size washer and dryer. The community offers a resort style pool, state of the art gym, business center, media room and is a gated community. Surrounded by wonderful restaurants, shopping and parks. This property is ideal for a business traveler or a small family. Come home to 4,500 sq. ft. of comfort while on the road. Enjoy a quiet neighborhood, comfortable beds, and two large TVs. This 4 bedroom, 4 bathroom home has two living areas, two dining areas and an office to use if needed. There is central air and heating and hot water available throughout the house. There are a refrigerator, two ovens, a gas stove, washing machine and dryer available for use during your stay. There is also an extra room upstairs with a sleeper sofa. Welcome to my brand new and comfortable town home with hardwood floor, stainless steel appliances, granite kitchen counter top, two car garage and many good amenities! Spacious area, open floor plan and the big windows make it look brighter. 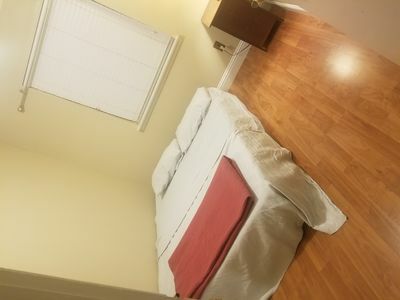 My town home is nicely furnished with King bed in master bedroom, Queen bed in 2nd and 3rd bedrooms. Futon sofa downstairs can be pulled out to a 4th Queen size bed. 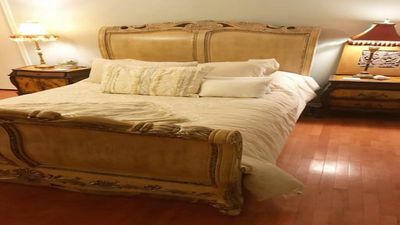 Daybed on the second floor LOFT area can be pulled out to one King size or two Double beds. Each of the three bedrooms upstairs has its own bathroom for privacy. The fourth half bath or powder room is downstairs. Besides cooking and eating utensils in the kitchen, I also stock one-time plates, forks, spoons and drinking cups available. Guests can also use the laundry room which has a big-capacity open-top washer and front door dryer. Laundry detergent, bleach and fabric softener is provided. Attached garage can park two cars. Street parking is allowed in front of the house. Because it's new construction, more parking is also available in the back of the town home community where the club house is supposed to be but not ready yet. Town home is located at Lewisville downtown. 2 Minute walk to Tiernery's Cafe where you can enjoy delicious home style food, Sunday brunch and live music (on weekends). Across Kealy street is Old Town Brewery, a draft brewing place with bar. 2 minute walk to Lewisville Royal Affairs Ballroom for wedding ceremonies. 5 minute walk to PERC Coffee house and Old Town Wine House in downtown Lewisville. 5 minute walk to Witherspoon Distillery, a "hidden gem" with relaxed atmosphere, outdoor games, live music, tours (need to book in advance) and amazing drinks, especially whisky bourbon lovers. Walking distance to Lewisville downtown Grand Theater, newly constructed Ferguson Plaza park, Twisted Root Burger, Cavalli Pizza, Prohibition Chicken, Dominio's Pizza. It might not seem to have a lot of residents now but the city is revamping the entire Lewisville downtown, and putting up new houses every day. 10 minutes walking to DCTA OLD TOWN training station. You can get to denton county, or switch to red line train to downtown dallas (American airline stadium) at Trinity Mills station. Close to highway exits. 5 minute drive to highway 121 (which goes to DFW airport) or also 35 east ( South to downtown Dallas or North to ). 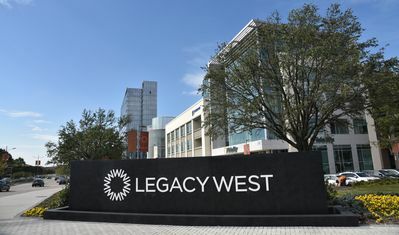 Very easy commute (10 to 15 minutes on 121) to Shop at Legacy, Legacy West, Frisco Stonebriar mall, Frisco Toyota Stadium, Top Golf, Nebraska Furniture ... all the north dallas fun places, and also the newly constructed Toyota, FedEx and Liberty Mutual North America Headquarters. It is a great place to relax and host families whether you are a small family or a crew coming to town! 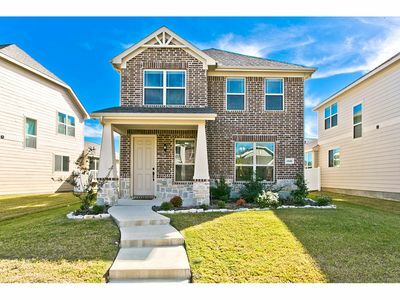 Heart of DFW 10 mins from Airport!Beautiful 3 bed 3 1/2 bath 20% off all Dec!! 5 Acre Country Estate - Perfect for Family Reunions, Weddings & Retreats! Magnolia Acres is a beautiful estate that sits on 5 acres in the midst of horse country yet only 7 minutes from high end shopping, dining and entertainment. The gorgeous grounds with fire pit, bridged pond and pool make it ideal for family gatherings, reunions, weddings, personal and corporate retreats, and photo shoots. While the pool is not heated, it is perfect for volleyball as it is shallow on both ends and deeper in the middle. There is also a beautiful 1500 square foot barn for events as well as table and chair rentals! The lay out of the home allows guests to have the best of both worlds; the house offers plenty of large common areas for everyone to gather while also providing every one with their own space and privacy as each bedroom has it's very own en-suite bath, flat screen TV and walk-in closet. It truly beats getting a hotel! Other rooms in the house include the fully equipped kitchen stocked with coffee maker, waffle iron, warming drawer, blender and more, the game room, equipped with a regulation size pool table and various outdoor and board games, the library, office/rec room, a formal living room, 2 dining areas and a huge sunken great room with 27 foot ceilings. The stars shine bright in this special piece of Texas! This home features 3 Bedrooms and 2 Baths in the beautiful Stewart Creek neighborhood. The private study includes a desk, workspace, and high speed internet. The open living area features plantation shutters and granite countertops in the gourmet kitchen. The master bedroom has a King bed. Secondary bedrooms are furnished with a Queen in BR2 and Two Twins in BR3. This home has a 2 car garage and fenced in side and backyard perfect for pets. It's located just a short walk to a neighborhood park that includes playground, fountain, and hike/bike trails. This home is in a great location in a quiet neighborhood only minutes away from both the Dallas North Tollway (DNT) and Sam Rayburn Tollway (121). The rate per day includes: • Rent • Furniture (Living, Dining, Study, and 3 Bedrooms) • Housewares (Cookware, Dishes, and Linens) • 48” LED Television in Living and Master with Digital Cable • High Speed Wireless Internet • Washer and Dryer • Utilities (Electric, Water, Gas, Trash, and Lawncare) This home is managed by Frisco Corporate Homes. 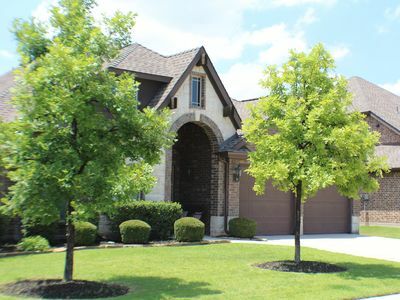 We have over 20 years experience providing our guests with housing in the Frisco, Plano, and McKinney communities. All of our properties are fully furnished and your daily rate does include all utilities, housewares, lawncare, and everything you need to feel at home. We are pet friendly and welcome all the members of your family, even the furry ones, to enjoy their stay with us. We have experience working with all of the major Insurance companies as well as most of the Temporary Housing providers. So if you’ve been displaced due to an insurance claim, we are very familiar with the process and would be happy to work with these agencies to get you into the home as quickly and easily as possible. Our minimum stay is 30 days and there is no maximum stay. Understanding that plans may change, we will keep the home available until you provide us notice. We never want to ask our guest to leave before they’re ready so this home will be yours as long as you need it. Fresh open large studio apartment with stocked bathroom. Accommodates 3. The bedroom suite offers a comfortable full size bed. The living area is furnished with a new full sleeper sofa. Our stocked kitchen is perfect for cooking & enjoying fresh meals. Fresh clean linens provided. Entire Private Apartment 24-Hour Check-In (after 3:00 pm). Free Covered Parking Space. Gym Interaction with guests Guests can come and go as they’d like. We are available by Homeaway and phone. 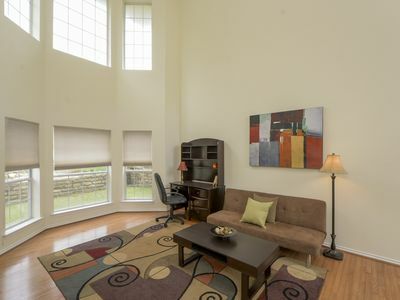 Corporate Apartment in West Plano. 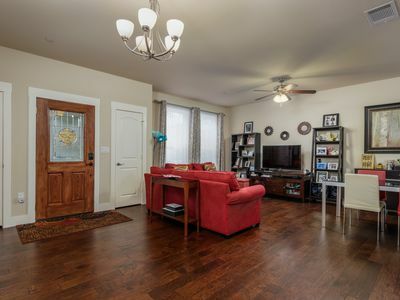 One Bedroom Apartment in the heart of West Plano. Located in the most prestige area of Plano with Legacy West and The shops at Legacy in your backyard. Every corporate headquarters within a 2 to 5 min walk and drive there isn't anything else you may need. 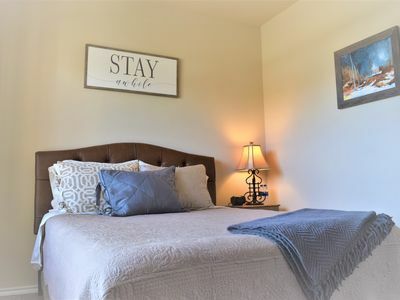 We offer a one bedroom apartment fully furnish with a full kitchen, living room with an office area with 100 mg internet speed, full size bedroom with a queen size bed, the bathroom has a garden tub and full shower with a walk in closet attached. This apartment has everything you need to have that home away from home feel. 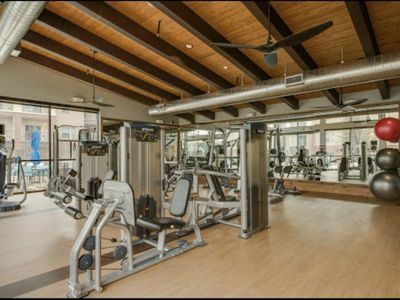 The complex has a state of the art gym, resort style pool, court yards with hammocks and grill areas, and a reck area with pool tables and shuffle board. 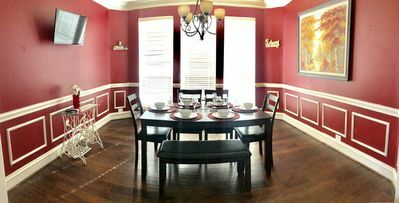 6 BD Group Home W/ Game Room & Theater On Private Golf Course in Carrollton!! 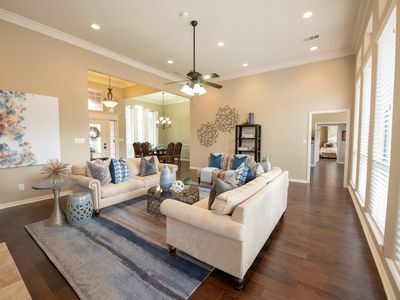 Home is located in the heart of golf course community in Carrollton, TX. 5 Bedroom with a common area/bedroom add on. This is a booming area with many great bars and restaurants within 10 minutes. It is 25 minutes from downtown, 15 minutes from the Ford Center at the Frisco Star and just 20 minutes from DFW Airport. Visit Koreatown for a unique and fun night of barbecue, karaoke and cocktails. Play a round of golf at Coyote Ridge and you will tee off right next to the backyard where you are staying. A New Way To Travel! Fresh open large studio apartment with stocked bathroom. Accommodates 3. The bedroom suite offers a comfortable full size bed. The living area is furnished with a new full sleeper sofa. Our stocked kitchen is perfect for cooking & enjoying fresh meals. Fresh clean linens provided. Entire Private Apartment 24-Hour Check-In (after 3:00 pm). Free Covered Parking Space. Gym Interaction with guests Guests can come and go as they’d like. We are available by Homeawy and phone. ***Out of town guests only. Any guest from the greater DFW area must contact host prior to booking. This spacious studio decked with first class amenities and upscale finishes is comfy and centrally located. High end finishes, stylish decor, Vegas style swimming pool, and a beautiful lounge are at your fingertips. You will be just a few steps from delectable dining, impeccable shopping, and entertaining night life. Major employers Toyota, JP Morgan, Liberty Mutual, and JC Penny are located right around the corner. This area serves the needs for anyone. We provide everything you need for a comfortable and relaxing stay. The bed feels like you’re sleeping on a cloud. We also have a futon, a 43” TV with Hulu and Netflix, and a dining table/workstation. High speed WiFi is available for you to use. Get comfortable and set the temperature where you like it. 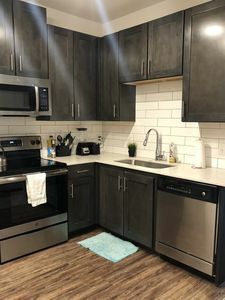 The kitchen is fully stocked in case you want to cook during your stay and we also offer complimentary breakfast items like coffee, tea, oatmeal, and breakfast bars. The bathroom is also fully stocked with luxurious towels, shampoo, conditioner, body wash, and lotion. You can even perfect your makeup with the LED mirror. If you like taking baths, the tub is a soaker tub. We also have a washer and dryer available for you to use along with bleach, detergent, dryer sheets, an iron, ironing board, hangers, and a full length mirror. You’re going to look so great on your trip so come and stay for an unforgettable experience! 6500 sq ft estate on 3.5 acres in the country with large diving pool, grill, patio furniture and fire pit with fenced back yard. Perfect size for a small intimate outdoor wedding and reception. Large open areas for meeting, visiting and making memories. Spacious kitchen and living rooms with 2 separate TV viewing locations with surround sound and multimedia connectivity. 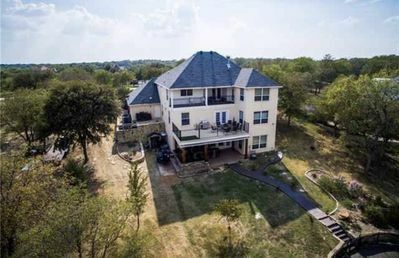 Indoor woodburning/gas fireplace, outdoor firepit with outdoor grill, pool with jacuzzi, and plenty of room to play football, throw a frisbee, Located near UNT, TWU, Texas Motor Speedway, DFW Airport, Dallas, Ft. Worth, Grapevine, Frisco, and Denton. If you are looking for a longer stay while in between homes, corporate stay, or doing business in the area our house is perfect for a small family with: 1,350 sqft, 2 bedrooms, 1.5 bathroom, dedicated office space with treadmill, utility room with washer and dryer, 2 car closed garage, backyard patio, huge walk-in pantry in kitchen, central heating and cooling Iron board, iron, vacuum cleaner, pots and pans, dishes and silverware, coffee maker, linens, towels etc Centrally located at one of the safest, quietest neighborhoods in West Plano with nicest neighbors Less than 10 minutes drive to Toyota, JCPenney, Ericsson, Frito Lays and headquarters of other major companies Less than 5 minutes to major tollways, 20 minutes drive to downtown Dallas Less than 5 minutes to Shops at Willow Bend Less than 10 minutes drive to Tom Muehlenbeck Recreation Center, one of the best sports/activity facilities in Plano 5 minutes walk to Arbor Hills Nature Preserve which provides excellent hiking/biking trails, parks, pavilions and playgrounds Town home built in 2002, remodeled and fully furnished in 2015 with all new furniture. Well maintained, spotlessly clean Community pool 55" LG Full HD LED TV and Spectrum Cable TV (including ESPN, TNT and Golf Channel) and Samsung Bluray Player in family room 42" LG Full HD LCD TV and Roku 2 Streaming Media Player in second bedroom Frontier Extreme HD with hundreds of channels including NBA TV, Tennis Channel, Golf TV and HBO. Home DVR to record shows. Frontier FIOS ultra high speed internet (50Mbps download / 50 Mbps upload) Perfect Wi-Fi coverage in every corner of the house, from garage to patio All bills paid.